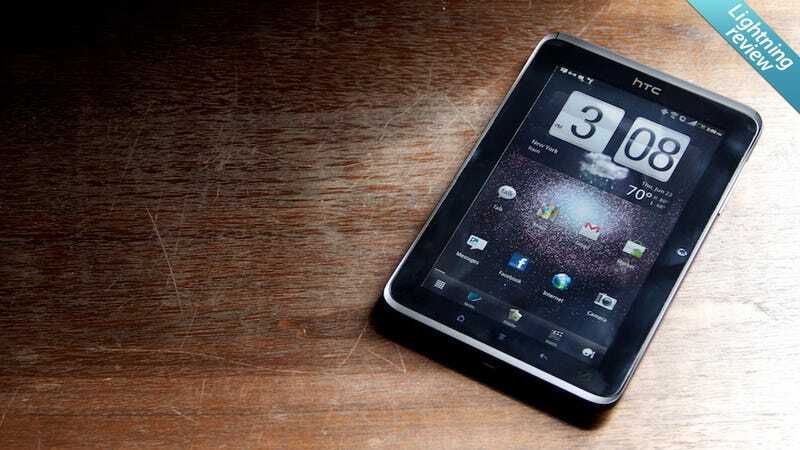 HTC Evo View 4G: Wanna Buy a Giant Phone That Doesn't Make Calls? The running joke since the iPad laced up its shoes is that tablets are big, over-glorified phones. That's silly! They share electricity, touchscreens, apps, and rectangularity, but that's about it. Except the Evo View, which is the joke's punchline. The 7-inch tablet is a maligned genus (and some might say an oxymoron), but whatever you want to call it, I like the way this thing, a conglomoration of aluminum and rubber, feels. Its weight (weighty), its girth (girthy), and its grip (um, grippy). The notification light is built into the power button. It's totally serviceable for web, mail, and other staples. It's got stereo speakers, surprisingly. The best detail? Orientation-shifting touch buttons along the bezel, so you really can use it in any orientation. Someone cared when they built this. This is, again, mostly just a big Evo. That's pretty much all it is. It's not running the designed-for-tablets Honeycomb—it's Gingerbread. And it stutters on occasion, more than it should. Reaching back into the primordial haze of tech time, the View clutches a little capacitive stylus, giving you the ability to do, well, not very much with an $80 accessory. You can take screencaps of anything you're looking at and draw on them, or you can take down handwritten notes to be emailed or tweeted away. It's $400 with a two-year contract. Locking yourself to this for 2 years would be silly. The Evo View 4G's a runt—so it needed to be either cheaper or faster, and it's neither. But I'm still willing to give seven inches a chance. From someone else.